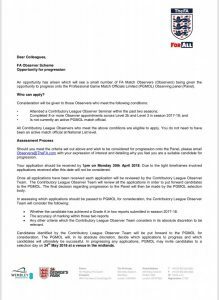 Ref Support UK are pleased to share news that the Professional Game Match Officials Limited (PGMOL) have opened applications for FA Match Observers to apply for the position to Observe Select Group Officials. Attended a Contributory League Observer Seminar within the past 2 seasons. Completed 8 or more Observer appointments across Level 2b and Level 3 in season 2017/18. Is not currently an active PGMOL Match Official. It is also stated that “All Contributory League Observers who meet the above conditions are eligible to apply and you do not need to have been an active Match Official at National Level”. 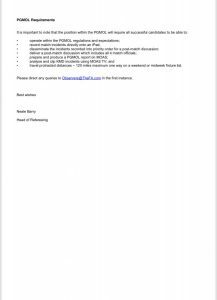 Ref Support UK Support this move from the PGMOL and The FA as any Observers who did not reach the National list should still be given the opportunity to progress. I have always said that you don’t need to be a dog to be a vet.